I equally relate to and want to be best friends with Jessica Day. She’s goofy, she’s corny, she isn’t afraid to let her true self show, and she responds to being uncomfortable with either singing, dancing, or finding another way to act like a crazy person–something with which I relate all too well. This is another character I relate to but also want to be buds with. I’d totally love to chill out with Liz on the couch, in a Snuggie, and work on my night cheese with her. But besties or note, Liz Lemon is me. I am Liz Lemon. Awkward, introverted, shy, with a love of writing, an unhealthy obsession with lists and other organizational office supplies, a killer sarcasm/eye roll game, who loves her friends to death (even though they are all nuts)? Yep. That’s essentially me and my life. Sometimes I don’t like to admit how much I see myself in Elliot Reid. That sheltered naivete (starting an “I hate Cox chatroom with no thought to the repercussions? I could totally see myself doing that…), her crazy mix of confidence and insecurity, and her insistence on replacing words she doesn’t like with gibberish words (I use her word “bajingo” regularly) all remind me of myself. Also, we’re both super German. Nothing makes me want to learn the language more than hearing her crazy German rants. I love Donna, and I totally relate to her. She’s in a long-term relationship with her high school sweetheart (because I take the finale to mean they got back together #DonnaAndEric5eva), she is constantly trying to find that balance between being there for the people she loves and achieving her dreams, she loves to read and write, and she’s got sarcasm for days. Donna is one of those characters that I both relate to, want to be friends with, and also admire a little. If Donna was a real person, she probably would have already solved world hunger and would most likely be our first woman president. Donna is awesome. I love Lily. She’s smart, she’s driven, she’s fiercely loyal, and she has a strong sense of justice. I’ve never gone so far to implement my own form of Aldrin Justice, but there have been several occasions where I’ve wished I was brave enough to try it. She’s not afraid to let her quirky, weird, dorky side show, and she has a marriage that is super chill but full of love and honesty. Her marriage with Marshall reminds me a LOT of my own marriage. I kind of want to be couple besties with them. What fictional characters do you identify with? Let me know in the comments! 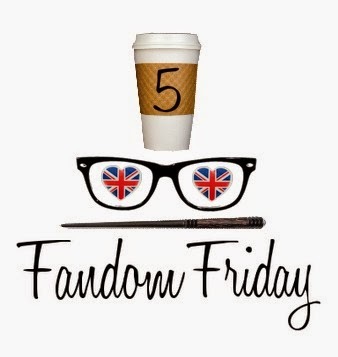 Be sure to check out my other Fandom 5 posts, and follow the hashtag #Fandom5 to see what everyone else is saying! I love this list! It’s pretty spot on for what I would pick for myself! I’m going to have a hard time coming up with different characters now. Donna and Jess are great characters! She’s crazy, but I love her! 🙂 And thanks! YES ELLIOT! Seriously, watching her on Scrubs is like watching myself sometimes. All time favorite quote: “I shouldn’t talk to people.” YES. And Jessica Day – so much yes. They are fabulous, aren’t they? Love ’em! I nearly put Lily on my list. I adore her and her fierceness. Liz is almost too relatable lol. I crack up every time I see that gif. Ah Jess, she is great – especially the signing about anything trait. LIZ! She made it onto my list too, she seems to say excatly what I’m thinking. Great list. Lots of brilliant, fun ladies.